The Canteen is a tribute to all things Jewish sleepaway camp. 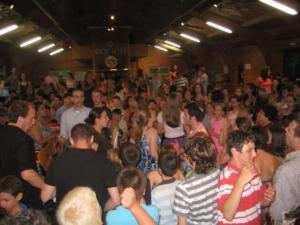 Hosted by the Foundation for Jewish Camp (FJC), this blog is written by campers, alumni, parents, and camp professionals and is a place to talk about parenting, camp fun, projects, crafts, recipes, and more – all tied back to Jewish holidays, traditions and, of course, camp! The campers sit, singing along in the dining hall, while the song leader gathers their spirits and latent energy after a hefty lunch of pizza. The first two songs of the song session are fine, campers and staff appear to be going through the daily ritual with a sense of delight but also has a minor feel of obligation to it…but…then…BOOM! The third song, the fan favorite, comes on the big projectors at the front of the dining hall, and all the song leader has to do is start strumming… The yells, dances, and screams of 600 people take over.. it’s time for Don’t Waste The Milk!!! 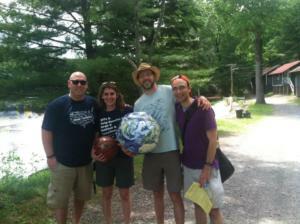 I enjoyed this past week at the URJ Crane Lake Camp in West Stockbridge, Massachusetts as a guest while my wife served as one of the rabbis on camp faculty. 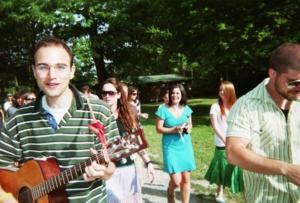 On this particular Wednesday I observed and participated in an after lunchtime all camp song session. Don’t Waste The Milk, a silly little tune about conservation that arrived at Crane Lake a year ago and with a very easy and catchy chorus, is shouted, clapped and danced by thrilled and blissfully happy Jewish campers and staff. I found it a bit funny and outrageous but really just fantastic. I wonder how this comes to be in this unique space that is Jewish camp. As a Jewish camp song-leader “has been” as one might say, 2000-2005 at the Mandel JCC of Cleveland, Ohio’s Camp Wise outside of Chardon, Ohio. I began to wonder – what makes a particular tune an obsession of a given camp? I’ve observed ruach (spirit), shira (songs), or sing-along sessions at multiple camps over the last several years and have experienced three more than any others starting with my “home” camp, Wise, where I spent 14 awesome summers. Wise has an abundance of these fan favorites – one that stands out especially from my camper days in the 1990s is Closer To Fine by the Indigo Girls. The camp would go so nuts they’d ritualize every verse with motions, chants, whistles, and even make up their own lyrics (example sung by the staff: “I spent eight weeks working for the JCC, got my paycheck and I was free!”). For the past six years I’ve been on the board of Pinemere Camp in Stroudsburg, Pennsylvania, which really is the camp of my in-laws, particularly my father-in-law as well as my wife. I have visited many times during Saturday morning and their traditional “sing,” while the song leaders, sing When The Saints Go Marching In and their beloved Frankie and Johnny. Frankie and Johnny especially is a pretty dark and depressing song but, the campers and staff on the “Green” (their main grassy area at the front of camp) beam as they shout the tragic and fairly unbelievable lyrics to be sung at Jewish camp. A Scoop of Silliness – Be it the lyrics, the melody, or the accompanying motions, or the context of singing these songs at camp of all places, there is an enormous amount of silliness conveyed in these songs. An observer might say: “Um… why are we singing this? What’s the point? This is odd and quite outrageous,” but at this camp (or in this era of camp… we know camp in one era can be different even just 5 to 10 years later) singing this is cool, awesome, and what we do. I think it starts with a bit of silly, or adding silly to once was a hit song in a different time. That creates a uniqueness, a specialness, a, “this is only for us,” feeling that I think campers (and staff) relish. Thus the “boom of awesomeness,” is set. Don’t Waste the Milk (as I observed last week at Crane Lake), is silliness at the perfect scoop. A Touch of Tradition– I haven’t been to any camp more entrenched (in a good way) in its tradition as Pinemere, which seem to sing the exact repertoire of songs for its song sessions today as it did when my father-in-law went to camp in the late 1960s and early 1970s. Songs and traditions, as I alluded to earlier, come and go but sometimes they come and they never go away, to do so at Pinemere and many camps would be an act of treason. Thus, Frankie and Johnny, a classic formerly lead by the camps original director, Bob Miner, and carried on today by his great-nephew Gabe seems to garner the interest of campers and staff new and old simply because it’s as if they are continuing (and connecting) to the sacred Pinemere past, and making it part of the present. To know that the words we (campers and staff) are singing today in the place we are today is the same as it was now three generations ago may be just so awesome and cool that, yeah, along with the silliness factor and the celebrity connection, the tune is ours, and we sing and participate with enthusiasm and gusto. It would be a dream to travel the Jewish camp universe (or at least North American landscape), spend three days at as many camps as possible, participate in all their camp song sessions, and study through observation, testimonial and survey what makes a camp song so spectacular, so we song leader types of the past, present and future can better understand the recipe to its success. Certainly, those who make song leading a career, those who have participated in Hava Nashira, or Jewish song leader boot camp (sadly, wasn’t available to me during my song leading days) may have more insights on this subject. Certainly, this piece didn’t consider any adaptation for Hebrew songs (which all of the Jewish camps I mention sing as well) or camps who sing all or most of their song sessions in Hebrew, and how these secret ingredients apply. As it is, my family and I thoroughly enjoyed our week at URJ Crane Lake, and I continue to drift my mind to my own camp memories at Camp Wise and Pinemere Camp, knowing that there in Massachusetts, Ohio, Pennsylvania and at the holy sites of Jewish camp all around this great continent something special is happening, really special: Frankie and Johnny, Don’t Waste the Milk, and all will be Closer to Fine. Many of the best-known American songs have been written by Jews--including many Christmas songs.